Here is an easy home soil test that will give you enough information to get you started down the road in your new garden design. information you need to plan your garden adequately. Just do this soil test and you will know whether your soil is more alkaline or acidic. To do this test, you will need to gather two plastic or glass containers, measuring cups, baking soda, a stir stick or knife, vinegar and water. This test may be done indoors, but has the potential of being a bit messy, so may best be done out of doors. 1. 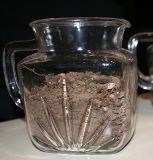 Add about 2 cups of crumbled soil to a container. 2. 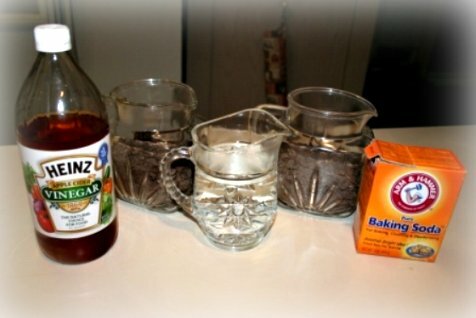 Pour 1/2 to 2/3 cup of vinegar into the soil and mix until you see the vinegar on the surface. 3. If the soil bubbles or fizzes you may have soil that is more alkaline. 4. 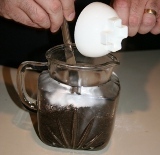 If the chemical reaction is minimal, take a fresh soil sample (about 2 cups) and add it to another clean container. 5. To this container add 1/2 to 2/3 cups of water to the soil and mix, again until you can see the water pooling on the surface of the soil. 6. Stir in 1/2 cup of baking soda. 7. If the soil bubbles or fizzes more actively, it is an acidic soil. If the soil reaction was more active with the vinegar, your soil is alkaline. In the test above, my soil is more acidic. While both of the containers of soil had some reaction, the reaction was more pronounced in the second of the two containers, which tells me that my soil is more acidic. My soil actually is right at the top of the acid scale, measuring at 6.5 on the soil pH meter. Thus neither reaction was very strong, but what I needed to know I have found out using this home soil test. Most plants will be happy in my soil since it falls in the middle range... with neither soil sample reacting overly strongly. If you want to save a dime or two, try this test first! Easy, and a GREAT experiment to do with your kids!